Hello and happy autumn to everyone! Looks like we will miss the leaves changing color due to the overabundance of rain. We will need to put some color in your world! We just installed three church windows in south Richmond. We have a contemporary cross, a dove with olive branch, and a hand painted medallion incorporated into our design of purples and . Please let us know if your place of worship needs our services. The Traditional Grand Entry DeCarlo in Northern VA was an interesting solution to a boring entryway. 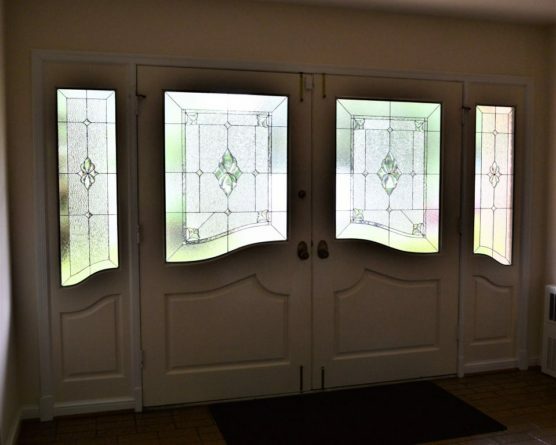 The customer’s entryway had satin frosted glass that had been installed by their door manufacturer. We removed 4 of the largest windows, installed double pane insulated glass units and caulked our decorative glass in and Viola! The DeCarlo’s are more than thrilled with the outcome! The Gary family in Maryland loves color and whimsical designs. They have a very large transom over their front door that we made a whole lot more exciting! Let us know what we can do for you. Send us a photo of the space, along with the dimensions of the glass, and we will have a solution for you! Diane Fairburn, our lead designer, will be doing in-home design consultations in the Northern VA area on Tuesday, August 14th. Please call us or email Diane at diane@dgsdelivers.com with photos of the space along with measurements of the glass portion of your window. She will send estimates and options to you and set up an appointment for you. 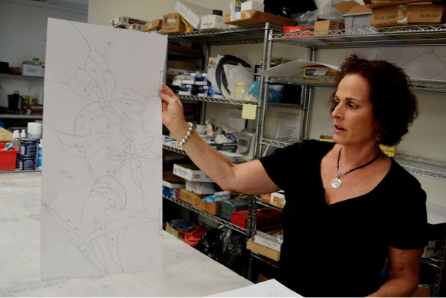 Diane was featured in The Richmond Times Dispatch last week! The work of Hanover County-based Decorative Glass Solutions is featured in new restaurants in the Richmond area. Diane Fairburn started the business after graduating from Virginia Commonwealth University 39 years ago. 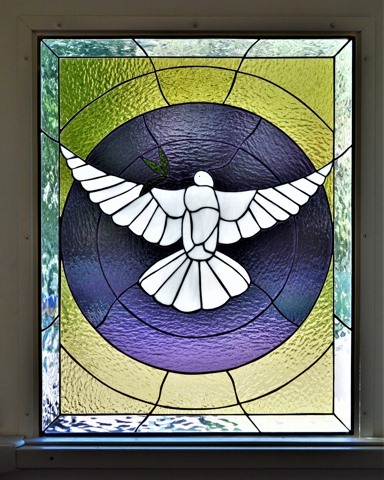 The company was initially called Stained Glass Creations. Fairburn said Decorative Glass Solutions recently completed installations in the Spoonbread Deux restaurant in the Short Pump area and in the Amici di Enzo restaurant in Goochland County. “Some people think all we do is churches,” Fairburn said. She said she has been commissioned by the Virginia Baptist Home Foundation to do a series of stained-glass windows for The Culpeper, a new residence home being built in Culpeper. “Each window will be purchased by a donor, nine windows in total, from which to choose of various river, mountain and farmland scenes,” Fairburn said. Hello and Happy Summer to all! We have been busy helping our customers with decorative glass solutions! For the Gamble job, they wanted more light, and to remove the unattractive glass in the entryway double doors and 2 sidelight windows. We removed the old glass and installed the leaded glass along with a piece of clear, tempered glass to meet building code. As you can see in the before and after pictures , the job was accomplished!! 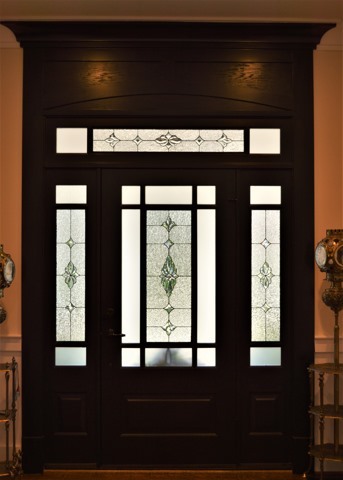 As for this next design, the Sharp’s had 2 leaded glass sidelights installed by the builder. The entryway also had a large, clear glass, circle top window. We were commissioned to do a custom piece for that window. 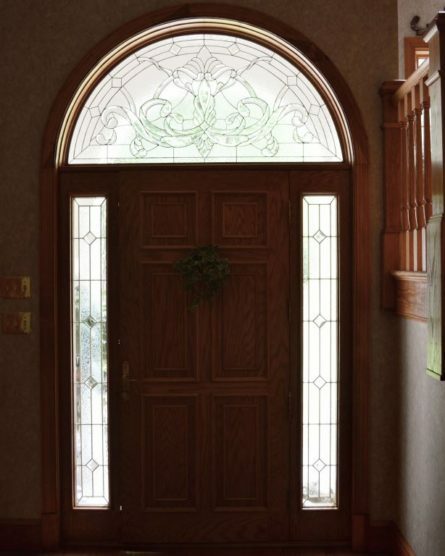 When an entryway has decorative glass sidelights, but the transom is empty, the entryway appears unfinished. By installing this beautiful window, they now have more curb appeal! Most of the bevels shown were custom made and it is stunning! What glass solution can we provide for you? Please send a photo of the space, along with measurements of the glass portion of the window and we will be happy to provide estimates and options. Got our leaded glass windows via fed ex and installed them today- they are gorgeous!!! Thank you so much for all your hard work. We are very pleased! I just had to write to tell you how thrilled I am with the transom window my contractor just installed. I have one big area, dining, living and kitchen and it finishes off the room beautifully, I just love it!!! Hello and Happy Spring to all our fellow glass lovers!! We had a very busy winter show season and into spring, installing new pieces for our customers. We did an install in Bristow, VA for a couple who had several transoms and bath windows needing privacy. The husband loves “cut glass” and has a large collection of glassware showcased in a lighted cabinet. 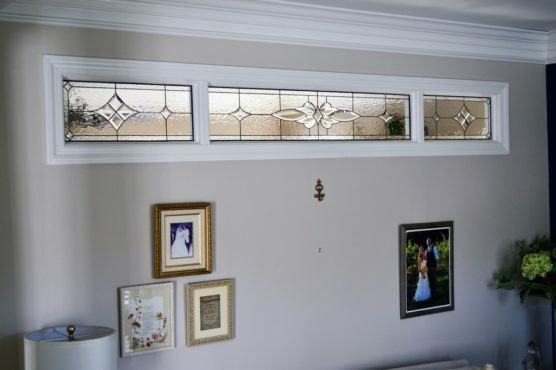 They went one step further and adorned their home with lots of our leaded glass, incorporating color in lots of the pieces. As you can see in the transom, we used mainly clear glass, but added a light amber border along with light blue accents. As for the master bath, the corner tub area is an expansive showplace for our work. Please keep in mind these windows are all clear, privacy glass. The green is just the trees! Please give us a call or email us a photo of your window or door along with measurements of the glass portion only and we will send you estimates and options! Hello and Happy Spring Glass Lovers! Our designer, Diane Fairburn, has openings for in home design consultations in the Northern VA area Wednesday April 18 in the afternoon. Please call ASAP for an estimate and to set up an appointment, as we fill up quickly! 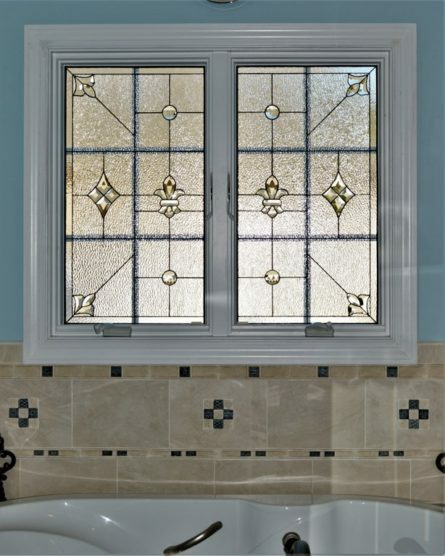 Our feature custom design for this month is a bathroom window we did for a renovation in Midlothian, VA.
We worked very closely with our customer who has loved leaded glass since she was a child admiring her grandmother’s glass. She loves the intertwining design work along with all the pretty bevels and textured glass. She required total privacy in most of the panel, however, she wanted to see outside. We used clear, antique glass in the top center to do so. Let us know your privacy glass needs in your master bath renovation plans and what we can do to enhance your “spa” experience! Stained glass is arrestingly beautiful. It can turn any interior space into a work of art. 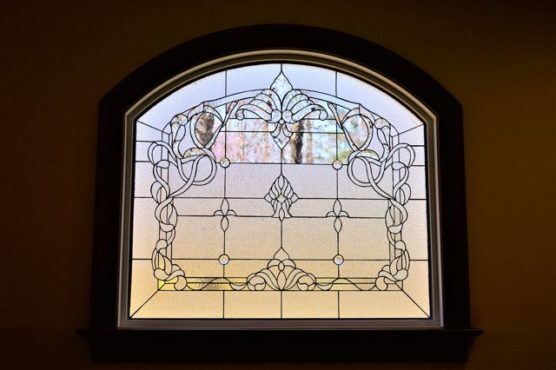 If you’re on the lookout for top-quality stained glass in Richmond VA, we would love to hear from you here at Decorative Glass Solutions. We’ve been dazzling customers with A+ decorative glass options since the end of the seventies. 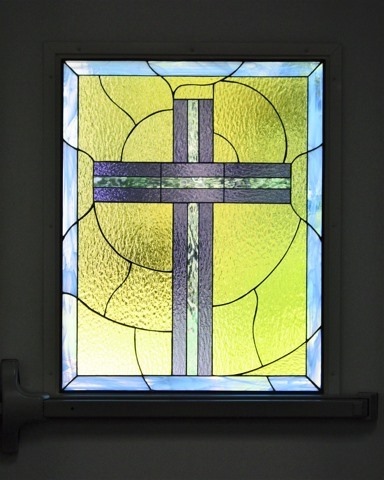 We specialize in stained glass windows in Richmond VA. We specialize in beveled glass and a whole lot more, too. When you need glass solutions that are elegant, durable and timeless, there’s no arguing that we can save the day for you. The advantages of turning to our company for attractive glass solutions are truly plentiful. We give customers access to customized designs that can accommodate their imaginations wonderfully. Our stained glass options can totally transform the feel of your living space. They can give you the convenience of additional privacy as well. If you want to safeguard your household from the prying eyes of passersby and your neighbors, our stunning glassworks are sure to do the job perfectly. Our stained glass windows in Richmond VA are convenient. We can upgrade your existing windows without taking them out. We install our glass on the interiors of doors and windows alike. Our company is known for the finest options in textured, leaded, beveled, stained and decorative glass. If you have a penchant for lovely handmade glass, you can’t go wrong with Decorative Glass Solutions. Our team members are hard-working glass experts who have a full commitment to customer satisfaction. Diane Nahan Fairburn is at the helm of our reputable studio. She’s a seasoned stained glass artist who has a zeal for intricate craftsmanship. Are you interested in stained glass in Richmond VA? Get in contact with our company as soon as possible to ask for a free estimate. Windows and decorative glass can make a big difference when it comes to decorating your home. If you’re thinking about replacing or upgrading your windows, one possibility you should consider is stained glass. This gives you the chance to give your windows and entire home a beautiful new look without actually replacing your existing windows. 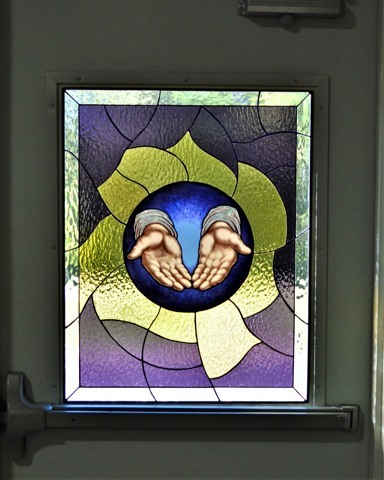 You can get stained glass in Richmond VA for many purposes, including windows, doors, screens, cabinets and more. Our stained glass windows in Richmond VA serve a variety of functions. They help give your home a stunning new look as you choose the style of glass that’s perfect for your needs. 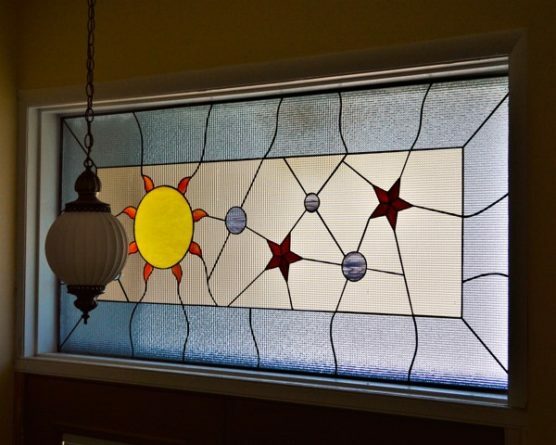 Stained glass gives you the ability to control the amount of light that enters your home. This depends on the colors and styles you choose. 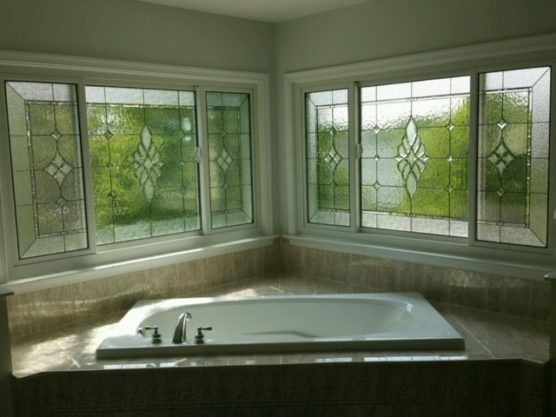 Stained glass also gives you privacy. Our decorative glass solutions can be made to your specifications. 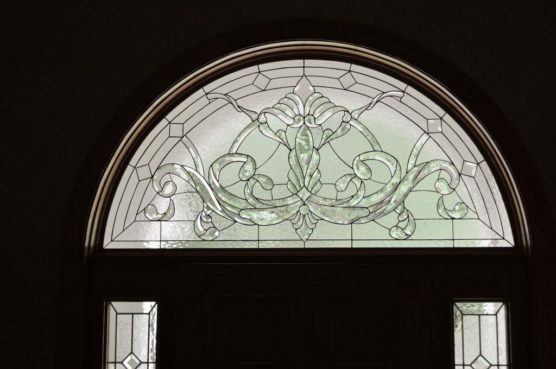 In addition to stained glass, we offer beveled glass, leaded and textured glass. These treatments are placed on the inside of your current windows or doors, making installation fast and simple. There’s no need to remove anything. 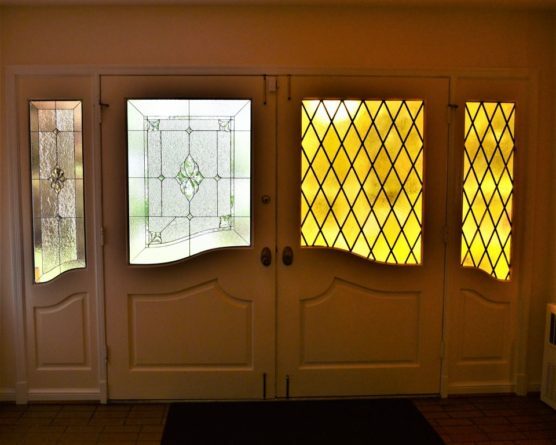 Decorative glass solutions are not only for windows. They can be used for doors, screens, bathrooms, entryways or anywhere you have glass. We can even create our triple-paned units in a wall opening where there’s not currently a window. Stained glass windows in Richmond VA give your home a distinctive and beautiful appearance. It’s one of the easiest ways to create the artistic atmosphere you’ve always wanted. You can choose from many colors and styles or create your own customized style. 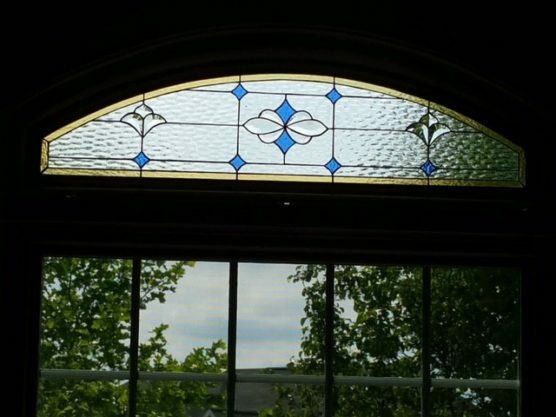 We install stained glass in Richmond VA, as well as our other products such as leaded or textured glass, to all locations within 150 miles of Richmond. We ship our products to anywhere in the continental United States.